Brexit is less important than the increasing fragility of Britain and the British Isles. The Brexit referendum bisected Britain. The vote was designed to demonstrate that Britain did not want to leave the European Union. In fact, had Britain’s political and business elite doubted that the referendum would result in a “remain” verdict, it’s unlikely the vote would ever have been called. But 52 percent of voters wanted to leave the EU; 48 percent wanted to stay. If 2 percent of voters had switched positions, the referendum could just as easily have gone the other way. Well-credentialed, well-spoken opponents of Brexit were certain that those who voted to leave the EU were uneducated and incapable of understanding the consequences of their vote. Brexit opponents attempted to delegitimize the referendum’s outcome by effectively delegitimizing the democratic process: They argued that just over half of the British public was not qualified to have an opinion – effectively saying that 52 percent of Britain’s voters should have left such serious matters to their betters. The divide that has emerged in the post-Brexit world threatens to reopen centuries-old uncertainties within the British Isles. The European Union itself was not the source of this divide, but its policies helped drive a deeper wedge. Free trade is the main problem underpinning Brexit. EU supporters in the United Kingdom prospered under British membership in the bloc. But free trade did not benefit all Britons, and in denigrating Brexit voters, the EU stalwarts failed to acknowledge this. Brexit’s core supporters were in the industrial areas of the United Kingdom, where people had lost jobs as British companies moved their factories to other countries or as Britain could no longer compete in certain industries. Second, who reaps the benefits of free trade? Although a country’s gross domestic product may rise, the benefits are not evenly distributed. Significant segments of society don’t share in the prosperity and may even suffer deeply while others profit. This appears to have been the reality behind the Brexit vote: Many gained from free trade, and many lost ground. The latter lost not only economic ground. They also lost the political ability to change the course of events. EU membership created a rigidity in the political system; many rules imposed from Brussels could not be turned down by Westminster. Hence, Britain lost a great deal of sovereignty. For those prospering under the EU, this was a small price to pay. For those who saw no benefit, the loss of political power rendered them helpless. This story has been told and told again. The contempt of upper classes for the lower classes was epidemic in Britain until around World War I; thereafter it gave way to a recognition of common citizenship. But the current telling of the story leads to a more important reality. However Brexit shakes out, Britain will remain divided and politically unstable. The bitterness of “remain” voters is striking. To them, this was not merely a policy debate but a question of who ruled Britain. If the withdrawal from the EU hurts their interests, their anger will become a fixed characteristic of the upper classes. If, on the other hand, Parliament votes to annul the Brexit vote or calls another referendum, a different but substantial part of the British population will become embittered. Either move would signal that the purpose of the first referendum was to affirm the elites’ position on the EU, and that they will keep trying until they win. Pro-EU advocates are certain they would win a second referendum, but nothing can be certain when it comes to matters of public opinion. Brexit, therefore, is institutionalizing a vast social divide, resurrecting the elites’ contempt for the poor and the poor’s hatred of the rich. 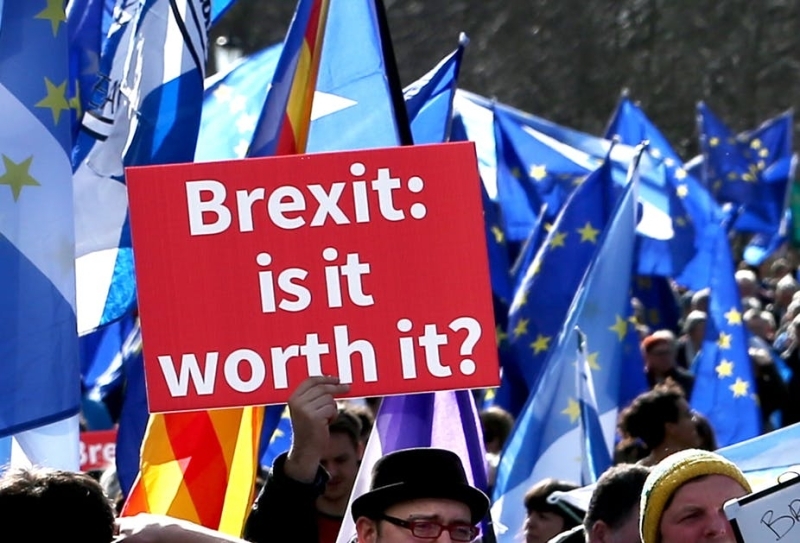 Even if another referendum saw one side win by a 70 percent to 30 percent margin, nearly a third of the population would still be profoundly opposed to the outcome. That’s a large slice of the population to leave steeped in anger and alienation. The British political system is in chaos. The Conservatives historically spoke for one segment of society, Labour for another. It’s no longer clear who is speaking for whom or whether their voices even matter. Brexit, therefore, has redefined Britain’s internal dynamic at a time when the question of the British Isles is reopening. In Scotland, an extraordinary 45 percent of the population voted to leave the United Kingdom in the 2014 independence referendum. That issue, like Brexit, is not closed. More important, the ever-dangerous Irish question has resurfaced. That question had been settled for a century, but Brexit has posed threats to a tenuous peace. Although the border region has not resorted to violence (save for a couple concerning incidents), historically the relationship between Northern Ireland and the Republic of Ireland, and both their relationships to Britain, has been explosive. So, as Britain passes through its most intense social crisis in generations, the cohesion of the British Isles is once again in question. It is not inconceivable that the Union Jack could become obsolete, and that Britain’s geography could contract to a size not seen for centuries. And if that happens, the dynamics of the Continent will change. These are extreme and unlikely evolutions, but five years ago the kind of class contempt and hatred that has emerged in post-Brexit Britain would have been unthinkable. Perhaps the most important point is that the EU issue was the trigger. As the reality of a swelling class divide emerged in Britain, the EU made managing the situation much more difficult. This situation is not unique to Britain. Class tension and political incoherence have become commonplace on the Continent and in the United States, as well as in Russia, where only 33 percent of people say they trust their president. In some ways, I am reminded of the interwar period of the 1920s and 1930s, when class tensions were profound. But even then, political parties in most countries were stable and predictable. The extension of the uncertainty to the political party system makes Britain’s current situation all the more unsettling.